It’s a fine line and it’s very hard to define. You have to push to have strong team chemistry at the same time you push to win. Sometimes those are competing forces. Sometimes it requires Trotter in the locker room getting in someone’s face. Or it requires Donovan sharing a joke to keep people laughing and cut through and dissolve some of the pressure that every one of us feels is on us to perform. Andy fostered that team chemistry. But it’s dynamic. It’s alive and moving. Once you get it, it doesn’t mean it will stay forever. You have to care enough to keep it or get it back. What does it take to be an effective locker room leader? Through most of the Andy Reid years, the Eagles have had no shortage of leaders. But what are the necessary traits? I’ve narrowed it down to five requirements, complete with one players who embodies the trait and one who doesn’t. Talented — If you’re not a starter, no one is going to take you seriously. Jon Runyan vs. Winston Justice. Experienced — Veterans command proper respect. Brian Westbook vs. LeSean McCoy. Vocal — Silence doesn’t get you anywhere. 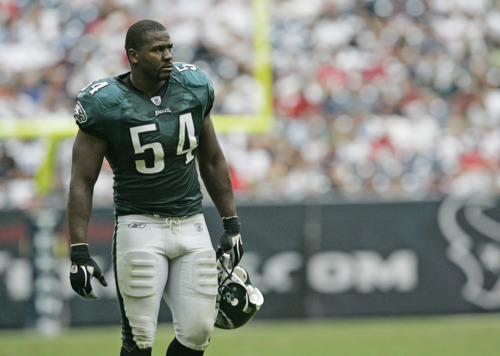 Jeremiah Trotter vs. Trent Cole. Mature — Responsible, accountable players only. Quintin Mikell vs. Asante Samuel. Tenured — On at least your second contract with the team. Brian Dawkins vs. Nnamdi Asomugha. If you look up and down the Eagles roster, you’ll find players that fit into the first four categories. There are talented veterans who are outspoken role models for the youngsters, but there’s a real shortage of players who’ve been with the organization for the long haul. Why is this important? A good team has players that set an example for others to follow. Sometimes they get in your face, sometimes they crack jokes, but they hold everyone accountable and united. These players aren’t around anymore, though. Look at the following graph, which shows the Eagles starters by the number of years they’ve been with the team. This isn’t NFL experience, but rather experience with this organization in particular. The 2011 team has the most first-year starters of any team after 1999. It’s tied with 1999 for the most first and second year starters. It has more starters with three or fewer years with the organization than any other in Andy Reid’s time as coach, and is tied with 2000 for the most four years or fewer. The 2011 Eagles are also only the second team to have not a single standard-bearer who has been with the team for more than seven years. In real terms, that means the team has exactly four starters — Brent Celek, Todd Herremans, Trent Cole, and Mike Patterson — who have been with the Eagles for longer than four years. DeSean Jackson and Asante Samuel are de facto veteran role models at four years a piece. Not a single starter has played in a Super Bowl as an Eagle. In retrospect, it’s not a coincidence that this team is falling apart any more than it’s surprising that the 2008 team stuck together and engineered a deep playoff run. That squad had a wealth of veterans on their second contracts, players who knew how to band together and make the sum greater than the individual parts. Those were players who conveyed what it meant to be an Eagle, and the team had reinforced that notion by keeping them around. Now almost all of those players are gone and no one has been groomed to replace them. The front office drafted “high character” guys who haven’t seen the field. They brought in veteran free agents to fill a void, but as outsiders they can’t set the locker room attitude. But the biggest problem is that this leadership vacuum isn’t going away any time soon. The free agent pickups are getting older. Most of the draft picks from 2006-2010 washed out, and those that didn’t (e.g. DeSean Jackson) largely haven’t been extended. Tagged with Philadelphia Eagles, NFL, Chad Lewis, Derek Sarley, Veterans, Leadership, Experience, Locker Room, Andy Reid, Jeremiah Trotter, Quintin Mikell, Brian Dawkins, Asante Samuel, DeSean Jackson, Brent Celek, Todd Herremans, Trent Cole, Mike Patterson, Front Office.